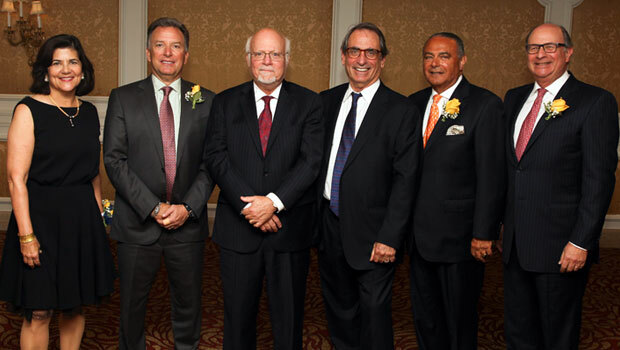 Four Hofstra Law alumni were honored at Hofstra University’s 2015 Alumni Awards Dinner on Sept. 24, at the Garden City Hotel. In all, nine Hofstra University alumni were honored at the event, which was hosted by Hofstra President Stuart Rabinowitz, the Board of Trustees and the Hofstra University Alumni Organization. Steven Witkoff ’83, who also earned his undergraduate degree at Hofstra, was recognized as Alumnus of the Year. Stuart Bass ’79, Judith Livingston ’79 and Robert Rosenthal ’74 received the Alumni Achievement Award. Steven Witkoff founded The Witkoff Group, a privately held, global real estate development and investment firm headquartered in New York City, in 1997. The firm is a market leader in the ownership and development of premier residential, hospitality, office, retail and mixed-use projects in major cities both in the United States and abroad. With extensive experience in all aspects of the development process, from financing and acquisitions through construction, Witkoff has successfully led the repositioning of over 70 properties comprising some 18 million square feet in major central business districts in the United States and abroad. Prior to founding The Witkoff Group, Witkoff co-founded Steller Management Company, where he acquired and repositioned a portfolio of residential buildings in New York City. He previously practiced as an attorney in real estate law at Dreyer & Traub and Rosenman & Colin, where he represented a number of large developers and investors. Stuart L. Bass, J.D., ’79; M.P.A. Stuart Bass, a three-time recipient of Hofstra’s Teacher of the Year Award for the Zarb School (1997, 2007, 2015), joined the Hofstra faculty in 1984. In 2001, he was appointed director of Graduate Programs at the Zarb School and was instrumental in revising a highly competitive M.B.A. program and was at the forefront in creating the M.B.A. program in Health Care Management in association with the North Shore-LIJ Health System. He also helped to launch the M.B.A. in Sports and Entertainment Management. He teaches business law classes at the undergraduate and graduate levels and in the Executive M.B.A. program. During his 30 years at Hofstra, Bass has served on the Development Personnel Committee, working as chair for three years. He has twice been elected to the University Senate and currently serves as chair of the Executive Committee, on the Planning & Budget Committee, and as a delegate to the University’s Board of Trustees, where he is Speaker of the Faculty. 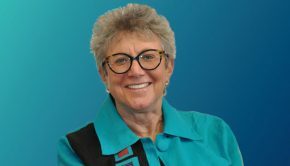 Judith Livingston, a partner at Kramer Dillof Livingston & Moore since 1989, has won 32 trials to date with verdicts in excess of $1 million – more than any other female attorney. She has negotiated hundreds of settlements that have resulted in payments to her clients of almost a half-billion dollars. She specializes in medical malpractice and personal injury cases. In recognition of her trial skills, Livingston was the youngest person and the first woman in the United States admitted to the Inner Circle of Advocates — an invitation-only professional group limited to the top 100 trial lawyers in America. Robert Rosenthal co-founded First Long Island Investors, LLC, a Long Island-based wealth management firm that is committed to providing individualized advice and counseling in the preservation, growth and administration of liquid and illiquid wealth for high-net-worth individuals, families and select institutions. He has also held leadership positions at Entenmann’s Inc., New York Islanders Hockey Club, L.P., and W.P. Stewart Asset Management (NA), Inc.
Rosenthal is vice chair of Hofstra University Board of Trustees and serves as chair of the Endowment and Investment Committee. Through personal philanthropy and the Jodi and Robert Rosenthal Family Foundation, Rosenthal and his wife, Jodi, have continuously supported Hofstra in its development efforts, including the creation of the Jodi and Robert D. Rosenthal Endowed Scholarship. He also is a member of the Executive Committee and the Board of Trustees of North Shore-LIJ Health System, as well as co-chairman of its Investment Committee and vice chairman of the North Shore-LIJ Health System Foundation. Rosenthal also serves as lead director of Systemax Inc., a New York Stock Exchange company.